I’m not sure why, but when I need to make a quick and easy meal, pasta is what I go for. This particular dish was a “what has it got in its cupboardses” dinner (I probably should go shopping more often). The dressing – I hesitate to call it a sauce – comes together in roughly the time it takes to boil the water and cook the linguine, which means that this can be put together in 15-20 minutes. It scales very nicely too. Put the oil in the pan over medium heat. When the oil is nice and warm, add the garlic and the onion. Let them sauté for about thirty seconds. Add all of the other ingredients except the linguine and cheese. Stir occasionally but briskly for 2-3 minutes. Cover the pan and reduce the heat to a low simmer. You can now let the dressing simmer on very low heat as long as the linguine needs to cook, as long as you’ve already started the linguine or are starting it pretty soon. Cook the linguine according to the directions on the package (unless you’ve made the noodles yourself; then you’re on your own). When the linguine is done cooking, drain it thoroughly and then return it to the pot. Add the dressing and then toss with the tongs. Serve immediately, sprinkled with the Parmesan if you like. This stores pretty well for 2-3 days, too, and is just as delicious cold as hot (at least to my taste buds). Questions or thoughts? Leave a comment! Posted in Stovetop. Tagged Italian, Main Course, Pasta, Stovetop. The beauty of stir-fry, though, is that it’s quick and easy to make at home. You’ll need a wok or a skillet, a sharp knife, a cutting board, a spatula, a plate and bowl, and a stovetop – that’s it. Even the ingredients are easy to find. As an aside, let’s talk about woks and skillets for a minute. If you have a large skillet, ten inches or more at the base, you can easily use it for stir fry, but you’re going to lose some of the effect of the wok. Personally, I love my wok, and if I can get away with using it to cook something I will. But when you’re cooking stir-fry, some woks and skillets are better than others: specifically, you want a steel or cast iron pan for cooking stir-fry. This isn’t elitism or me being in bed with the Cast Iron Wok Industry; it’s a matter of safety. Stir-frying is done at really high temperatures, and it’s possible that if you have a non-stick wok, the heat will cause the coating to come off the wok – and you don’t want Teflon in your stir-fry. Julienne the carrots and celery. The matchsticks should be no more than 2″ long. Dice the jalapeño, and wash your hands afterward. Peel the onion. If using a whole small onion, cut it in half. Cut the onion into 1/8″ strips. Stack the steak strips and cut them again, still against the grain, into 1/4″ strips. You should end up with strips of steak that are as long as the original steak was wide, 1/4″ wide, and 1/8″ thick. Place the meat, salt, and pepper in the bowl and quickly toss until the meat is coated. At this point you can put everything in sealed containers in the refrigerator – keep the meat and vegetables separate! – and store it for up to 24 hours. The vegetables will obviously last even longer. Heat the wok over high heat until a droplet of water flicked into the wok evaporates in about one second. Add 1Tbsp of oil and the onions. Stir-fry until the onions turn translucent (1-2 minutes), then scoop them – but not any remaining oil – off onto the plate. A side note: stir-frying onions is an excellent way to season a new wok. Add oil to the wok until there’s about 1Tbsp, then add the rest of the vegetables. Turn the vegetables with the spatula until they have absorbed all the oil, then scoop them off onto the plate. This should take 2-3 minutes. Add 1Tbsp of oil and the meat. Turn the meat a few times in the oil, then spread it out so it’s in a single layer around the bottom and walls of the wok. Leave the meat alone and let it sear for ~1 minute. Reduce the heat to medium. Begin turning the meat, stir-frying vigorously for another 2-3 minutes, until the meat is fully cooked. Return the vegetables to the wok, and add the garlic, ginger, soy sauce, and remaining oil. Stir-fry vigorously for another 30 seconds. Remove the wok from heat and serve the stir-fry immediately. Posted in Stovetop. Tagged Main Course, Stir-Fry. It’s no secret that I love Indian food, and when I can’t get to an Indian restaurant, I have a couple of recipes that do a halfway-decent approximation. This is an ultra-simplified recipe, but it tastes delicious and it’s really, really easy. I use some frozen ingredients here; you can use fresh or canned if you want. Note: If you don’t like or can’t eat yogurt, you can safely leave it out. Just ignore step 3 of the cooking directions entirely and reduce cooking time to 6 hours. This recipe serves 4-6, but it’s easily scaled up or down. If you’re using bone-in chicken, let the crockpot do the work for you! See below. Put the chicken, potatoes, peas, onion, tomatoes, and 3T of curry powder into the crockpot. Set the heat to low, stir the pot up a bit, put the lid on, and leave it alone for 6 hours. In 6 hours, if you’ve used bone-in chicken, use a pair of tongs to fish the bones out. The meat should fall right off! After you’ve removed the bones, or if you don’t need to, add the yogurt and the remaining 1T of curry powder. Allow to cook for another hour. Posted in Crockpot. Tagged Crockpot, Indian, Main Course. Chicken noodle soup is great for recovering from a cold and for warming up a chilly autumn or winter night. This recipe goes a lot easier if you can get boneless, skinless chicken thighs; otherwise, there’s an extra preparation step in the middle. It’s fine to replace the vegetables with frozen soup or stew vegetables. If you are using bone-in chicken thighs, let the crockpot do the work for you! See below. Put the chicken thighs and half of the spices into the crockpot. Set on high and cook for 2-3 hours. If you are using bone-in chicken thighs, remove the bones after the thighs have cooked for 2-3 hours. This will make getting the bones out much easier; they may even separate on their own. Once the bones are removed (if necessary), add the broth, the vegetables, and the rest of the spices. Reduce heat to low and cook for 2-3 more hours. About half an hour before serving, add the egg noodles, along with a pinch more of each spice, and stir well. Well, I know what I’m making this weekend! Posted in Crockpot. Tagged Crockpot, Main Course, Soup. 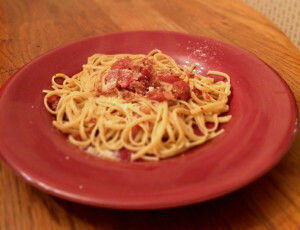 I’ll start off with one of my favorite dishes to make (and one of my son’s favorite to eat): spaghetti. I made this last night, but forgot to take a picture, so I’ll add one the next time I brew it up. This spaghetti sauce is based on my mother’s recipe; I’m not sure where she got it. It’s easy to make both on the stovetop or in a slow cooker; I tend toward the latter since at the moment I only have one pot and I need to devote it to the noodles. I’m doing my best to keep this low-salt and low-fat, which means that the natural flavors of the ingredients really come out. If you’re using cumin seeds, grind them using the grinder or mortar and pestle until they’re a fine powder. If you’re using fresh tomatoes, dice two of them. If you’re using fresh tomatoes, purée the remaining tomatoes. Either mince or press the garlic. Wash the mushrooms and cut them into 1/4″ slices. Include or discard the stems as you see fit. Cut the end off the jalapeño pepper, and slice one side of it from stem to tip, leaving the seeds intact. You don’t want to cut it entirely in half; just open one side up. If you’re using a slow cooker, set it to low heat. If you’re using a soup pot, set it over a medium-low heat – a high simmer. Add the tomatoes (diced and puréed) to the pot. Put the sauté pan over medium heat and add the beef. While it’s browning, stir and agitate so that it breaks into small chunks. Once the meat is thoroughly browned, lift it out of the pan with the slotted spatula and transfer it to the collander, leaving as much of the grease as possible in the pan. Rinse the beef briefly under warm water; then transfer it to the pot. Remove the beef grease from the pan as well as you can and add olive oil until the mixture coats the pan. Sauté the onions and garlic together, stirring frequently so that the garlic does not stick to the bottom of the pan. When the onions are light and translucent, use the slotted spatula to transfer them to the pot, again leaving as much grease as possible in the pan. If there isn’t enough oil left in the pan to coat the bottom, add olive oil until the mixture coats the pan. Sauté as many of the mushrooms as will fit in the pan face-down without touching. Do not stir or agitate the mushrooms; leave them alone. When you see beads of moisture start to appear on the tops of the mushrooms, transfer them to the pot with the slotted spatula, add enough olive oil to coat the bottom of the pan, and repeat this step until all the mushrooms are sautéed. Add the oregano and cumin to the pot. Stir vigorously. Place the jalapeño pepper cut side down on top of the sauce. Close the crockpot and let it cook on low heat for 4-6 hours. Cover the soup pot and let it simmer for about an hour. Every 5-10 minutes, carefully remove the pepper with the tongs, stir the sauce vigorously, and return the pepper to the top of the sauce. At the end of the cooking time, remove and discard the pepper. That looks like a lot of steps, but it’s actually quite easy in practice – the key is setting everything up ahead of time. Rinsing the beef removes a huge amount of the grease that would otherwise be going into the sauce, which helps keep the sauce more unified (the grease tends to separate from the tomato purée during cooking). Placing the jalapeño on top, rather than mincing it and adding it to the mix, gives the sauce a more subtle heat and jalapeño flavor without the heat becoming overwhelming. You can use turkey in place of the beef, but I find that the flavor is quite different and, frankly, I don’t like it as much. Posted in Crockpot, Stovetop. Tagged Crockpot, Sauce, Stovetop. Every cooking show, cookbook, and cooking column these days, it seems, is based around the idea that you, too, can create works of art in the kitchen… as long as you have access to their New York bodegas and international markets. This blog challenges the second half of that notion; you don’t have to fall back on aspic and Karo pour-ons just because you’re not a jet-setter and don’t live in a major city. My name is Ellie, and I believe that food can and should be amazing even if you live in the tiniest town in the whole country. Posted in Meta. Tagged Meta.